Image Size: 24"w x 13 3/4"h.
Scrooge was a miser. His money was his life. 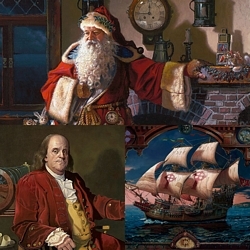 Then, one Christmas Eve, Scrooge received a trio of visitors who showed him not only the true meaning of Christmas, but the true meaning of life. Morrissey’s painting depicts London, circa 1843, when Dickens first published the story. The offices of Scrooge and Marley are in fact the pub in the city where Dickens reportedly did a great deal of writing. As Scrooge leaves for home on that fateful Christmas Eve he seemingly heads away from the light and joy of the holiday represented by both the carolers and a Father Christmas further down the street. Yet, these are actually his first steps towards redemption. This is a piece art destined to become one of your family’s Christmas heirlooms and holiday traditions.